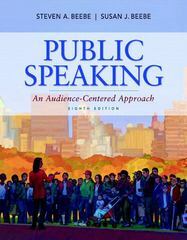 Public Speaking 8 Edition Updated in a new 8th edition, Public Speaking: An Audience-Centered Approach brings theory and practice together. Its distinctive and popular approach emphasizes the importance of analyzing and considering the audience at every point in the speech making process. This model of public speaking is the foundation of the book, and it guides the reader through the step-by-step process of public speaking, focusing their attention on the dynamics of diverse audiences, and narrowing the gap between practice and the real world.